A tour bus traveling along a California highway slammed into a tractor-trailer early Sunday, killing 13 people and injuring at least 31 others. The bus, operated by USA Holiday, was returning to Los Angeles from the Red Earth Casino in Thermal, California, Jim Abele, a chief of the California Highway Patrol said at a press conference. 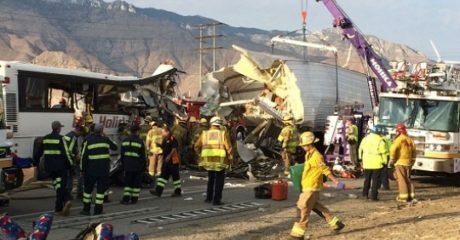 The crash occurred near Palm Springs. It’s unknown if drugs, alcohol or fatigue were factors in the accident, Abele said. But the speed of the bus was so significant that when it hit the back of the big rig, the trailer entered approximately 15 feet into the bus. The bus driver was killed, and the truck driver received minor injuries. Abele did not reveal the nationalities of the victims but said authorities were in contact with consular officials of Mexico, Japan and Australia and that most of the passengers were Hispanic. Passengers told officials that most people were asleep when the crash occurred at 5:17 a.m. Abele said he didn’t believe the 1996 bus had seat belts and likely didn’t have a “black box” data recorder with which newer vehicles are outfitted.